This week, Mom went on a mesmerizing preview of the Spirits in October Walking Tour of Riverside Cemetery. 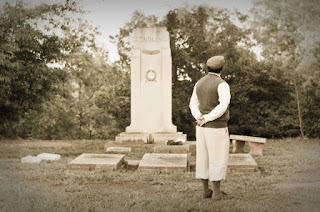 Along the way, she came across the "spirits" of several notorious Macon residents who relayed their personal history that led them to their final resting place. To say their accounts were chilling, would be an understatement. Mom got goosebumps alright, but she wasn't scared, she was in utter, total awe of the amazing people who came before her in her beloved hometown. Some of their stories were tragic. Some were folkloric. And others would have never known their story would be told for years to come. But all were monumental . . . and inspiring. This tour is a must for Maconites. Go beyond Duane and Berry's grave and learn about other big players who made a difference in the song and soul of the South. Tours take place from 6-7:30 p.m. October 22, 23, 29 and 30 with a special walking tour on Halloween. Tickets are $20 adults, $10 students ($25/15 on Oct. 31) Reservations are required and can be made by calling 478.742.5328 or e-mailing conservancy@riversidecemetery.com. The event is presented by the Cox Capitol Theatre, Historic Macon and the Historic Riverside Cemetery Conservancy. And for an extra special treat, check out the photo of one of the "Spirits," Macon's own famed boxer Stribling Young, who left this earth far too young. Thanks to the fabulous Maryann Bates for the haunting image!